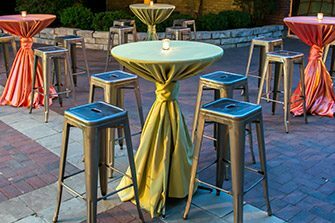 For most events – especially weddings or corporate events – it’s easy to forget about table rentals until the last moment. 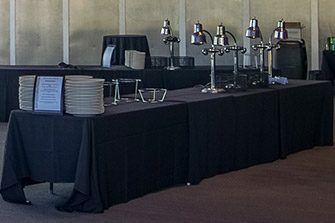 To help you plan ahead, here’s a look at every table you might need for an upcoming event, plus our product ideas. The standard tables for guest seating are a 60” round table and an 8’ banquet table, and both seat 6-8 people. 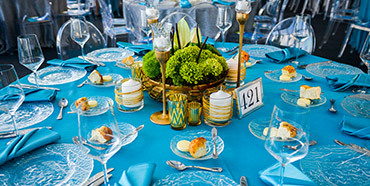 The rounds encourage mingling; banquet tables can be put together to create longer family-style tables. 60” square tables are a modern option. You need a table to hold the catering equipment, as well as plates and flatware. For a classic look, combine 8’ or 6’ rectangular tables as needed. 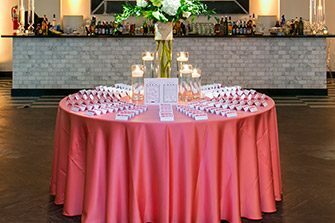 To create a setup with more visual interest, use 60″ serpentine tables with a round cabaret table on either end. For any cocktail hour, highboy tables (also called pub tables) are the way to go. They encourage moving about the room, provide a great place to set drinks – and more guests will fit standing at a highboy than seated at a standard-height table. The check-in table is where your guests pick up name badges or place cards and perhaps, sign a guest book or register for the event. 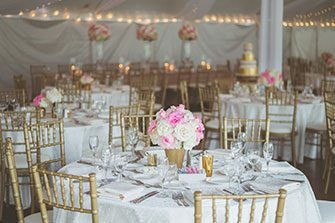 For most guest lists, you can’t go wrong with a classic 6’ rectangular table or 60″ round table. The size of your cake or featured dessert will help determine the size of your table. 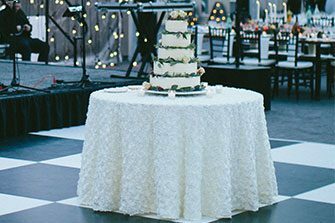 The 48” round table is a great place to start, but we’d be happy to provide guidance when you have details about the cake’s size from your bakery. Need a table you don’t see here? We’re happy to help.